Dehydrating food is one of the best ways to frugally make dried foods and meals, or create a food storage pantry. This is the story of how I got hooked on dehydrating and found the best dehydrator for my needs. Check out some of the great recipes too! It all began quite innocently. At the time this story began, my family was notorious for letting produce spoil and I was tired of wasting money at the grocery store. Wasting food is one of my pet peeves and as a frugal mom, throwing away unused food annoyed me to no end. As well, I hated paying exorbitant prices for dried fruits at the grocery store when I could do them myself. I decided it would be a good idea to invest in a food dehydrator to save some of the produce. This is where the trouble began. I decided to purchase a modestly priced, mid-range dehydrator. That way, if I didn’t like dehydrating, then I didn’t make a big investment. As a preparedness-minded individual, I also knew this would be a good tool to have on hand for emergency preparedness. I found out quickly how easy it was to dehydrate foods, and, as you can expect, things got a little, errr, out of hand. I became obsessed with dehydrating and began dehydrating anything I could get my hands on. It was fun for me. I loved the idea of taking a fresh cooked meal and turning it into a dried meal for later use, or dehydrating chopped vegetables and turning it into a soup (My favorite was dehydrating chili). Needless to say, I dehydrated so much that I burned the motor out of my first dehydrator in a matter of months. Clearly, I was a fan so I made the choice to upgrade from a mid-priced dehydrator to the best quality. I knew I would use it and I wanted exceptional durability. With all the dehydrating I planned on doing, I wanted a quality product that would be reliable for years to come. I found the Excalibur food dehydrator and knew this was the product for me. 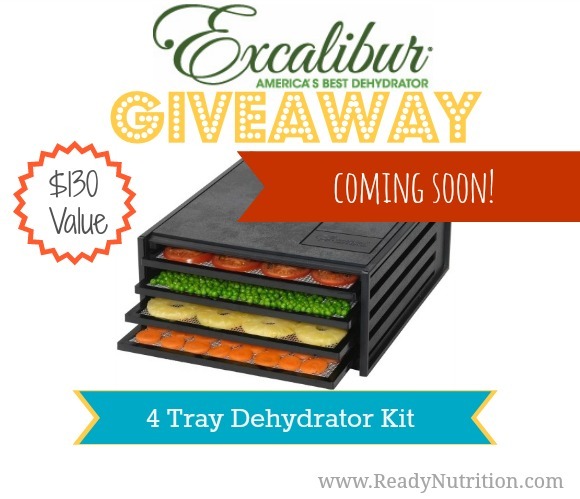 I found the 9-Tray Excalibur food dehydrator to be the right product for my family. What I loved the most about my new Excalibur dehydrator was how evenly everything dried out. The powerful fan in the back of the unit creates the perfect environment for circulating warm air to evenly dry out the food. The dehydrator that I purchased also had a clear door that I really liked. This way, I could check to see how the food is drying without releasing the heat. It also had a timer on it that made overnight drying a breeze. Although you are getting the best product, the price of the Excalibur is on the higher end of the price range. The drying sheets are very narrow and you can easily lose food over the side if you aren’t careful. Some of the Excalibur products are quite bulky and will take up precious counter space. Because these dehydrators are made to last, they have some weight to them. Although the Excalibur is an investment, you will save money at the grocery store purchasing marked up dried fruit. As well, there are so many recipes you can use. By doing this, you can make a plethora of foods to use during emergencies when the lights go out, for camping trips, or to put in your pantry for another day. Here are some recipes I have used over the years that are popular with my family. Best of all, you are saving money in the process! Here are some great recipes for those just beginning to dehydrate. Careful, it’s addicting! Wash and core the apples. Cut the apple into ¼” to 3/8” slices or rings; discard any bruised portions. Dry at 135◦F/57◦C. Approximately 7-9 hours. (Humidity of location will determine time for dehydrating.) For a sweeter flavor, sprinkle the slices with sugar and cinnamon prior to drying. NOTE: Dehydrated apples lend themselves particularly well for use in a variety of baked goods such as pies, tea breads, and cookies. Wash and remove the stems. To remove the skins, dip the tomatoes in boiling water, then immediately in cold water. The skins should just slip off. Cut larger tomatoes in ¼” slices and halve the cherry variety. If you have an excess of low acid tomatoes you’d like to dry, puree them in a blender and add 1 tablespoon of lemon juice or vinegar to each quart. Dry at 155◦F/68◦C until leathery or brittle, approximately 5-7 hours. ** For puree, line trays with Paraflexx® or parchment paper. NOTE: Chop dehydrated tomatoes for chili, soups, stews, and vegetable dishes. The dry puree can be powdered and converted into tomato sauce or tomato paste. Select a tender roasting cut and trim off any fat. Steam, braise or simmer the meat in a small amount of water for about 2 hour or process in a pressure cooker for about 35 minutes. After removing the meat from the heat, drain and cover. Chill overnight in a refrigerator. Cut the meat into ½” cubes of relatively uniform size. Spread sparingly over dehydrator trays and dry. Approximately 6-8 hours 155◦F/68◦C. To determine if the meat is thoroughly dry, cool a cub and try to cut it through the middle. If no moisture remains in the center, the cube will be difficult to cut. ** To use dehydrated cook beef or venison in soups, etc, pour 1 cup boiling water over 1 cup of the meat cubes and soak for 3 to 4 hours. Using any fruit you like, cut into small chunks. Place on a dehydrator tray lines with a Paraflexx® sheet or parchment paper. Dehydrate approximately 1-2 hours at 105◦F/41◦C until soft and juices are flowing from fruit. Store in glass jar and refrigerate for up to 1 week. Combine ingredients in medium bowl and thoroughly mix. Spread 1/8” thick on Paraflexx® sheet or parchment paper. Dry at 155◦F/68◦C until dry. Cut into strips. Hot stock – either beef, chicken, liver or whatever you would like to use. Combine ingredients in medium bowl until dough is mixed well. Roll dough into a round 1” thick. Cut into ½” to ¾” chunks. Dry at 155◦F/68◦C. Check treats in 4 hours. Add more time if needed. Chucks should be very dry. FOR CAT TREATS, you may add flavors such as shrimp, fish stock, or cheese flakes. Add dried or fresh parsley to add a little breath freshener to the treats. So there you have it, my justification for an obsession with a kitchen appliance. All kidding aside, I absolutely love my Excalibur and would recommend it to anyone. 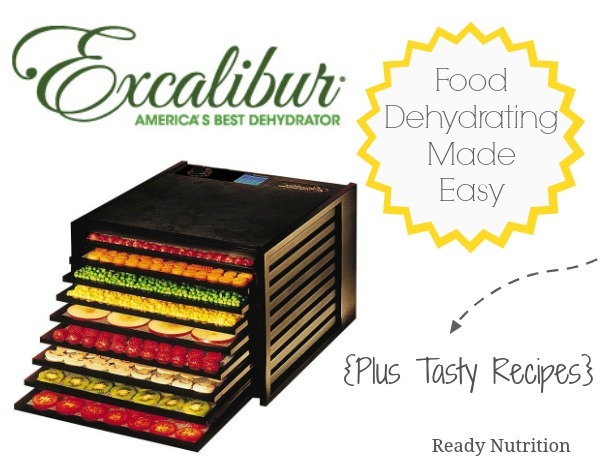 Whether you are looking for a small scale dehydrator to use occasionally, or one that will be a permanent addition to the kitchen, there are multiple Excalibur products to choose from. Well, I couldn’t tell y’all about this great product without offering one to you. We’re going to be having a giveaway for this product very soon. Sign up for our newsletter and we’ll let you know when the giveaway starts. Look forward to the Giveaway. I just bought a Presto Dehydrater from Wal-Mart. I’ve used it one time on banana slices, but didn’t really like the results. It sure doesn’t have everything the Excalibur has, so I wonder if that dehydrater would give better results. I’m going to go try again with mine with some carrot slices now. Hope I have better luck!